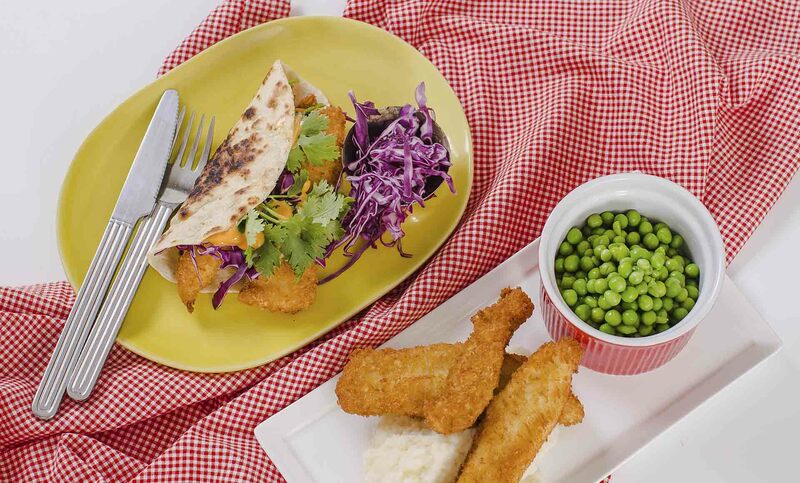 Deliciously fresh tacos for you, easy fish fingers for the little ones. 1. Preheat the oven to 180˚C (350˚F). Fill a steamer with water and place over medium heat. Lightly grease a baking tray with vegetable oil. 2. Cut the fish into bite-sized chunks. Place the flour, eggs and panko into three bowls. Dunk the fish into the flour then the egg then the panko, ensuring they are entirely coated. Put aside on the baking tray. 3. To make the Baja white sauce, grab a mixing bowl and add the mayonnaise, sour cream, cumin, smoked paprika, onion powder, garlic powder and lime juice. Mix together then taste and season with salt. Set aside in the refrigerator. 4. Place the red cabbage and coriander into a bowl and dress with the vinegar. Toss well and set aside. 5. Place a dry, non-stick frying pan over medium heat. Grab two tortillas and place them on the pan, one on top of the other. Cook until mottled and brown on one side then flip. When one side of each tortilla is cooked, remove from the pan and place under a tea towel to keep warm. Repeat until all are cooked. 6. For the little ones, place the fish into the oven and cook for 15 minutes or until golden brown, then remove. Heat the mashed potato and allow to cool. Place peas in the steamer and cook for 8 minutes. 7. To serve the little ones’ meal, plate the fish, mash and peas and serve (break one open to ensure the fish is cool enough to eat). 8. For the grown ups, place tortilla on plate and top with fish, red cabbage and coriander, red onion, a squeeze of fresh lime juice and a drizzle of the Baja white sauce over the top. Recipe and image extracted from Our Meal, Their Meal by Aaron Harvie, New Holland Publishers RRP $35.00. Available from all good book retailers.